For those of you who don’t know, I live in the sunshine state where fall does not exist. Really, it almost seems to be something people make up in movies to make Floridians jealous. Northerners are posting pictures on Instagram like “hey look at us with our pretty color changing leaves and our leather jackets we’re so cool” while we’re still down here sweating bullets in flip flops. Yes, I’m salty. Any who something AMAZING happened yesterday and for the above mentioned reasons, I got a little over excited. And I did just that. 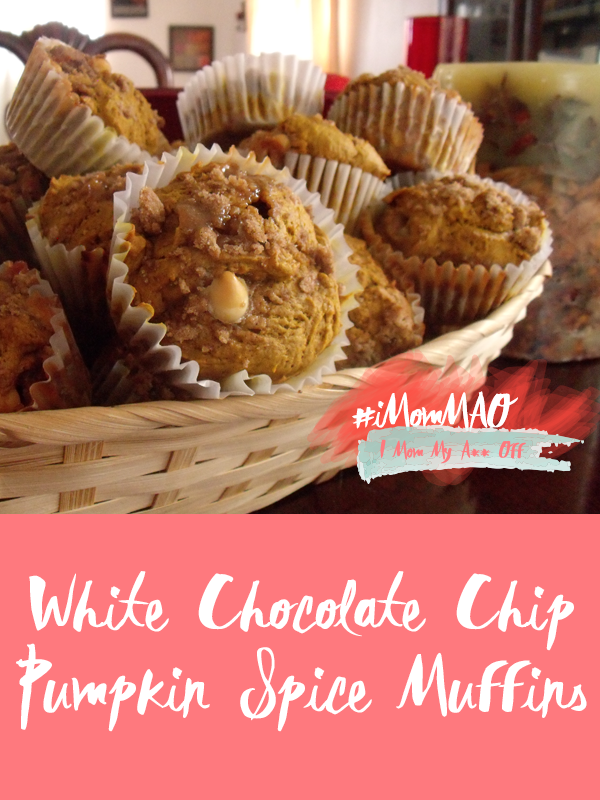 These muffins are so moist, so light, so perfectly spicy with just the right touch of sweet. It was a #forkasm in my mouth. Without a fork. YOU. HAVE. TO. BAKE. THIS. 1 cup plain, nonfat yogurt. 1 12 oz bag of white chocolate chips. * I only use coconut oil to make me feel like I’m eating something slightly healthy. You can use butter or regular vegetable oil instead. Preheat oven to 350°F. In a bowl, whisk together the wet ingredients for the muffins with the brown sugar (4 eggs, yogurt, pumpkin puree, and coconut oil). In another bowl, sift together the dry ingredients for the muffins leaving the (flour, baking soda, baking powder, salt, cinnamon, ginger, cloves, nutmeg). Slowly mix the dry ingredients into the puree mixture. Fold the white chocolate chips into the batter. Batter should turn out slightly doughy. Line a muffin pan with cups and scoop batter into the cups with a ice cream scoop. Combine ingredients for streusel topping and sprinkle over the batter. Put in preheated oven and bake for 30 – 35 minutes. Yields about 40 muffins. Bake this? Comment below and let me know if you loved it as much as I did!